There are low, grey clouds on the horizon. It is damp and chilly. We see great, glowing reddish jellyfish floating above the water. Soon smaller ones are floating all around the ship. The smaller ones are about the size of a small melon, or two good-sized fists. They have long tentacles, and I could see they had eyes. Some floated up as high as the crow’s nest. They wander around the ship, either curious or aimless, I couldn’t tell. After a couple kíren, they all floated away. They harmed no one, although Tékuna developed a rash from one that he captured and preserved. The rash was easily healed with a spell. There have been rough seas lately. There were waves higher than any we’d seen so far. 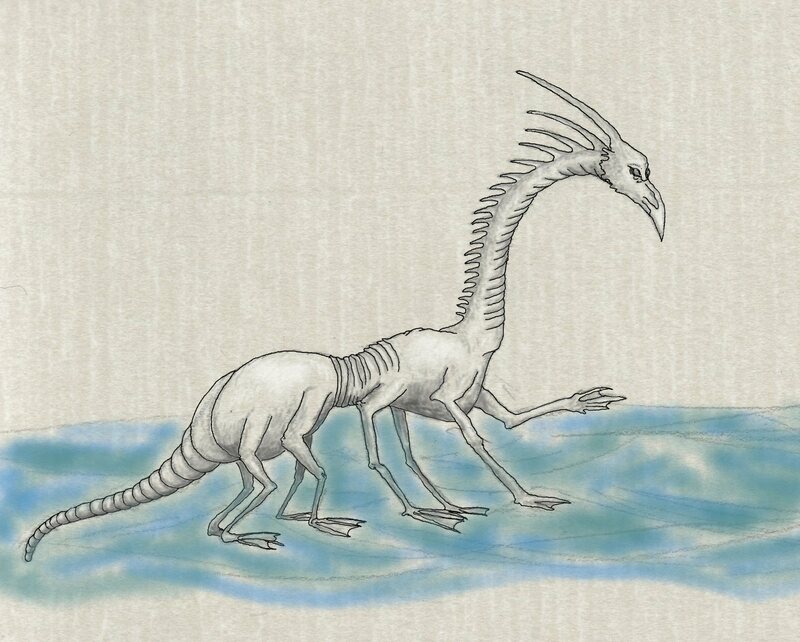 When the sea became somewhat calmer we began to see great, tall creatures with multiple legs that walked across the waters on wide, flat feet. They were about four and a half dháiba tall and walked in a long procession in a single file. They did not notice us and did not appear hostile, although they looked fierce. Tékuna and I wished we could see them more closely, but Vakúlaz was reluctant to approach them. The creatures made deep, lowing noises. This is a drawing pretty much as Phil drew it in my sketchbook. I scanned the original pencil drawing and went over it to outline the creature and added a little shading. I also added the rear back legs that Phil didn’t include in the original sketch. I don’t recall that he told us the name of the creature. Maybe someone else who was there that night remembers. We passed Súchel Head. These are the lands of the coloured Ssú. To be on the safe side we stayed well out in the channel, although most of us spent at least a little time gazing south into the jungle hoping to catch a glimpse of the creatures. After we left Súchel Head we were in open waters. Our supplies were still in good shape. The Shén have a wonderful melon, which when kept in a water barrel, will keep the water potable and free of parasites, but it does give the water a slightly acidic taste. We continue through the Straits of Shéngelu. We loaded up some bales of leather and plenty of chrr melon for the Shén and got ready to sail. I talked with Arámish and Vakúlaz about the route to Nuroáb. We had heard rumours that the town may have been deserted due to the plague. We sighted Arghá. It is a small, muddy city with dense tropical foliage. When we pulled in some Shén officers came aboard. Mridék negotiated for a berth and after a while we went into town. It was just some scattered houses that were surrounded by dry hills beyond the jungle. I suggested to the commander that it might be a good idea to purchase some slaves who might know the waters and lands that will be ahead of us. Our first stop was to change money. Here they use a large copper coin called a krsh that is worth 1 ½ káitars. Twenty krsh got us a berth for the night and a fresh water supply. The marketplace begins right at the wharf. Chrr melons were sold everywhere. The slave market consisted of a few ramshackle pens with five or six humans and a few ancient grey Shén. An old Shén came out to ask if we needed any help. Zagár was able to translate for us. An older slave approached us and said he had travelled in the west and spoke Tsolyáni in addition to some of the Naqsái dialects. He told us that there were about fifty languages spoken in those lands. He explained how he had been a prisoner for about seven years, and that he had once been an emperor of Tsolyánu, a tailor, and a sailor. The poor soul seemed crazy and depressed. We asked the Shén about any other slaves and found a younger Mu’ugalavyáni man who spoke Tsolyáni and some Naqsai. He had never been to Dalái and said that no one sane ever goes there. He told of how he had been captured by Shén when his ship was sunk. He was desperate to leave and promised to do whatever we wanted. We decided to take them both. The old Shén offered to sell us a mráchdach, which we soon learned was a red Ssú. The Shén keep them as pets and enjoy the high-pitched squealing, chiming noise they make when poked. The old Shén told us there were green ones, too. The creatures run wild in the forests of Súchel Head and the colour was enhanced by the food they eat. He told us the Chíma also keep them as pets. We got the slaves for a reasonable price and picked up a supply of chrr melons for the Shén on board. When we showed the slaves to Vakúlaz, he said they might come in useful. The Mu’ugalavyáni slave is called Arámish and has skills as a shoemaker. The older slave made a grand show of recognising Davé, as if he was greeting a relative. The slave claims to be the former emperor Mridóbu. Davé liked the slave and bought him from Mridék for the rather large price of two large gems, and then ordered extra sleeping mats for his cabin. I don’t understand why Davé insists on humouring the crazy slave. We managed to lose the Shén ships, or they lost interest in us. We passed a grey mountainous landscape. Our next stop will be Arghá, on the southern continent. We sighted Ssorvá. There were red-sailed Mu’ugalavyáni ships leaving the harbour and heading northeast. A ship of wild, drunken Shén passed us. Soon we could see the town constructed of low black stone buildings with insets of bright copper inscriptions. Shén buildings all look square-ish and build of crudely cut black rock and have oddly shaped doors. We were approached by a pair of Shén rowing what looked like a small, round, leather boat. When our Shén declared that they smelled all right, they were invited to be the guest of the harbourmaster. The captain made arrangements to stay three days. After all this time it was good to get off the ship. There were all sorts of things for sale in the market. There were bags of black glass that the Shén grind down and use to polish their scales. There were brightly coloured bolts of cloth, and a lot of copper-work. We stopped at the stall of a Shén jeweller. He showed me a crystal that glowed from within. He told me that it needed to be fed in order to glow, and recommended the head of a slave as proper food. I doubted the story, and even if it were true, it would be far too difficult to keep it fed on the voyage. I looked at the moonstones he offered, but he wanted too much for them. Davé left us to go to the Tsolyáni quarter to get some cash. Others went in different directions to look at other items that they were interested in. I looked at a few more stalls. The food looked particularly unappealing. I lost interest in the market and instead noticed that Shén have an unusual form of haggling. The set price of everything is 250 coins. I wasn’t sure if they meant their coins or káitars, or if that even mattered. I felt annoyed and hot, it was oppressively hot for this time of year, so I decided to return to the ship to rest. Later I learned that Mridék and the crew members had been told that I’d been kidnapped, either by Shén or bad humans. They spent some time looking for me before heading back to the ship. They also weren’t successful in the marketplace. Tékuna bought a copper sphere covered with inscriptions. He said that it was very valuable and it cost him 350 káitars, the equivalent of 200 of their coins. Mridék had requested that the Shén hire on another one of their kind to replace the one who was lost when we rid the ship of the Naqsái sorceress. Apparently many of the Shén wanted the job and fights ensued. One of our Shén was badly wounded and I later heard that some of the Shén were killed in the riot that developed. I noted that Shén bleed green blood. There was talk of shámtla and impounding the ship. Mridék ordered the ship to set sail immediately. Not all of our Shén were on board, but they planned to catch up with us. We had to hurry because the Shén harbour watch were pulling an enormous chain across the entrance to the harbour to block all traffic. Our Shén managed to obtain a rowboat and caught up to us just outside the harbour. It looked as if a group of Shén ships were making ready to pursue us, so we quickly made for the Straits of Shéngalu. We sighted land – a swampy, low island. Writhing eel-like things rose out of the shallow muddy water. The captain steered the ship to the eastern side of what must be the main port, but more closely resembles a mud village. Our sailors told stories about malicious Shén, pirates, and thieves. Legends tell that anyone who lands here never leaves again, but we need to put in for fresh water. There was some argument. Mridék wanted the Shén to go into town to buy fresh water, but they didn’t want to. They finally agreed and after a time they returned saying that they’d bought sufficient amounts of water from a Tinalíya merchant who would deliver it later. All the while I watched the black Shén ships come and go from the port. They were close enough that I could hear their barking, growling language as commands were given. Later we pulled out and headed for Ssorvá. It was hot and humid with no wind. The ship moved slowly with limp sails. Davé had a deck of the round leather Livyáni playing cards and spent time sitting on the deck playing á’ab with the crew members. We saw plenty of Shén ships passing in both directions.